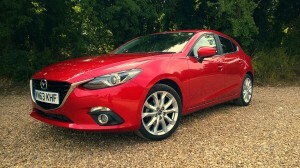 The New Mazda 3 from First Vehicle Leasing. Click for hi-res image. Hot on the heels of the Mazda CX-5 and 6 comes the new 3, which is the latest SkyActiv model to be launched by the Japanese maker. The old model wasn’t a bad car, but it struggled to compete with the very best in the class, so Mazda is hoping this will change with the launch of this all-new hatchback. It’s certainly more distinctive than its predecessor with its long and low bonnet, sweeping lines and aggressively styled snout with large winged grill. At the rear a raised waistline, sleek roofline and slim lights finish off the look making the Mazda 3 one of the more eye-catching hatchbacks in its class. 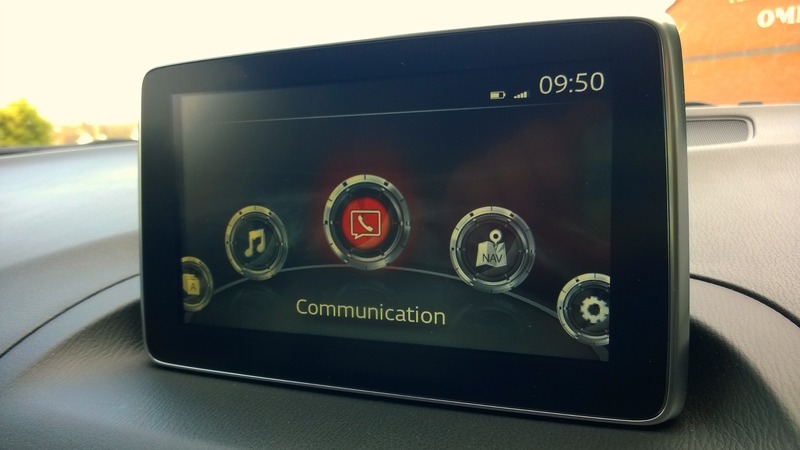 Inside, Mazda has managed to create a cabin that not only looks and feels sophisticated but is a pleasure to sit in with its simple lines and well laid out controls that come together with high quality materials. A sporty driving position with high transmission tunnel and stubby gearlever make the driver feel instantly at home along with the small, chunky steering wheel. 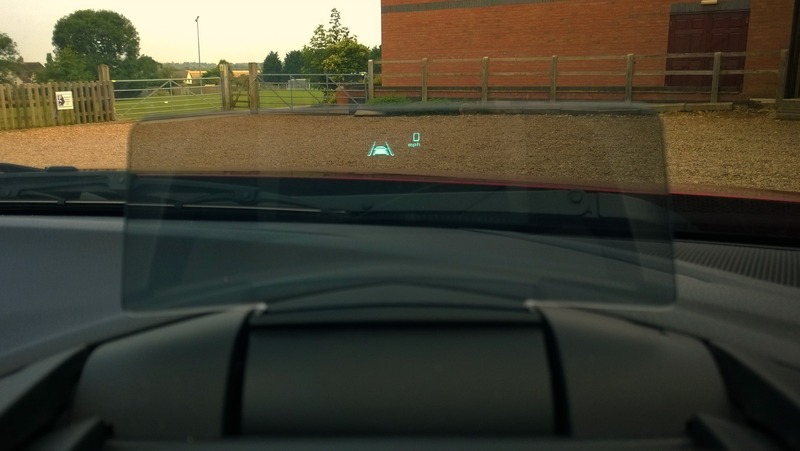 Many of the cars functions are controlled via a slick touchscreen infotainment system that sits on the dash top that can also be operated by a rotary knob next to the handbrake. 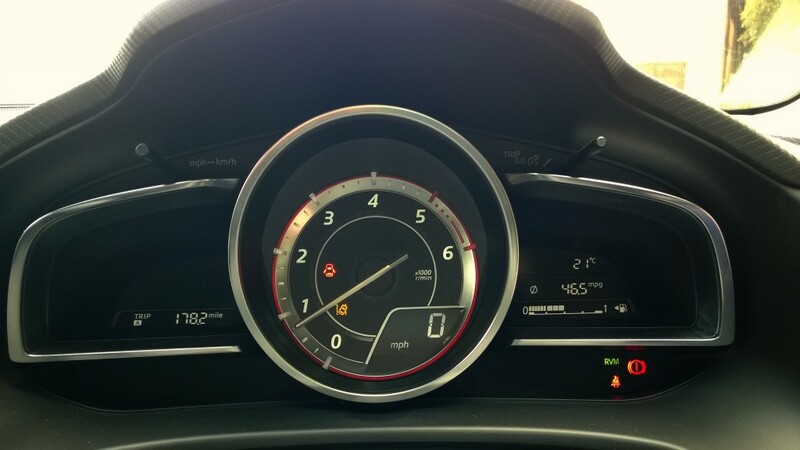 The dials are also a highlight with a large central rev counter and digital speed readout with ancillary readouts either side. Rear view of new Mazda 3. 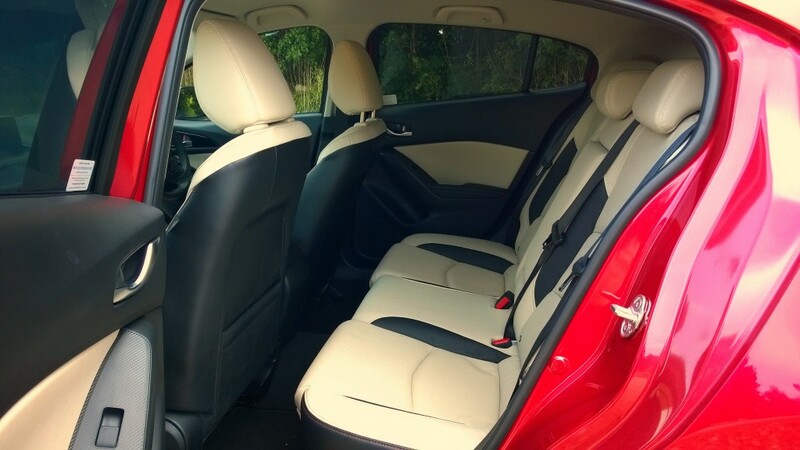 Not only is the cabin smartly designed but it also offers competitive levels of space for four passengers with just enough rear head and legroom to satisfy taller passengers. The only minor disappointment is the lack of storage areas for keys and phones not helped by tiny door pockets that are only just big enough for a drinks bottle. Luckily the glovebox is a useful size. 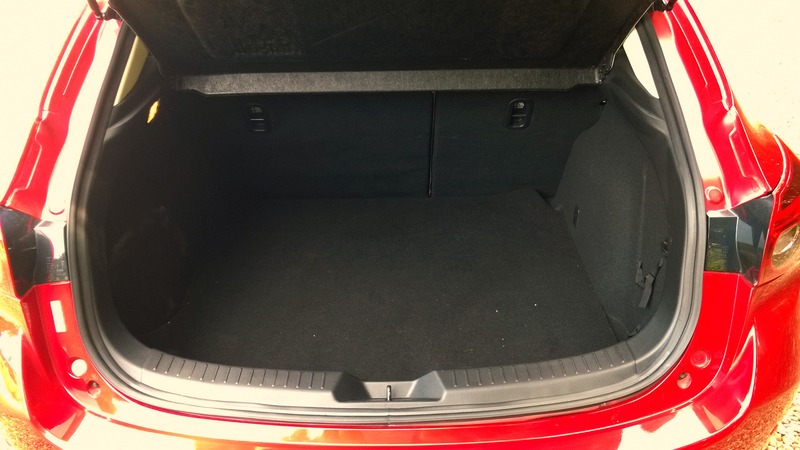 Luggage space is average compared to rivals offering 350 litres, and is hampered by a bulky load lip, but the rear seats do fold flat for carrying larger loads. 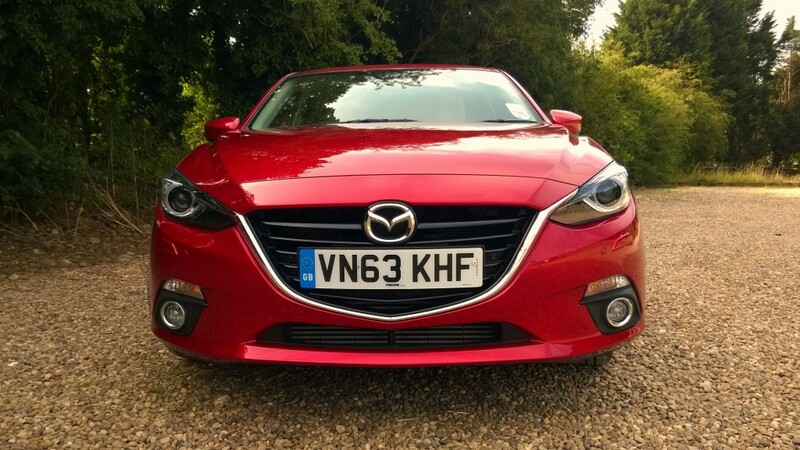 My test car came fitted with Mazda’s latest SkyActiv 2.2-litre diesel unit which produces a very healthy 148 bhp and 280 lb ft of torque from just 1,800 rpm. The moment you turn the key there’s a noticeable lack of diesel clatter and vibration even when cold. With such generous reserves of power the 3 can accelerate to 62mph in just 8.1 seconds and on to a top speed of 130 mph. Power delivery is linear with very little turbo lag and a good spread of torque makes light work of hills and inclines. It’s also beautifully flexible and refined on the move. Central controls for infotainment system in new Mazda 3. Unlike the previous 3 the new model is based on Mazda’s new SkyActiv platform rather than one derived from Ford and has sophisticated multi-link rear suspension. It has one of the longest wheelbases in its class which pays dividends on the road. 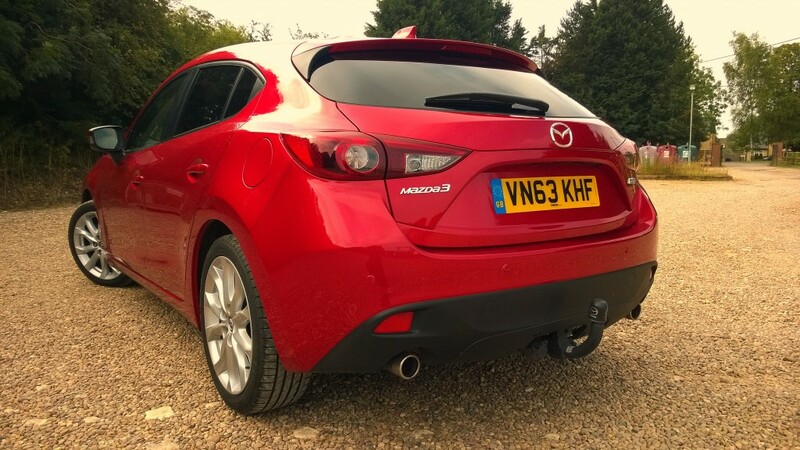 As soon as you set off the Mazda’s beautifully supple ride is instantly evident managing to smooth out any surface in its path despite generously proportioned alloy wheels fitted to my test car. There’s also very little wind and road noise filtering through to the cabin even at higher speeds. Despite the brilliant ride the 3 handles incredibly well. There’s plenty of grip and very little body roll which really inspires confidence. 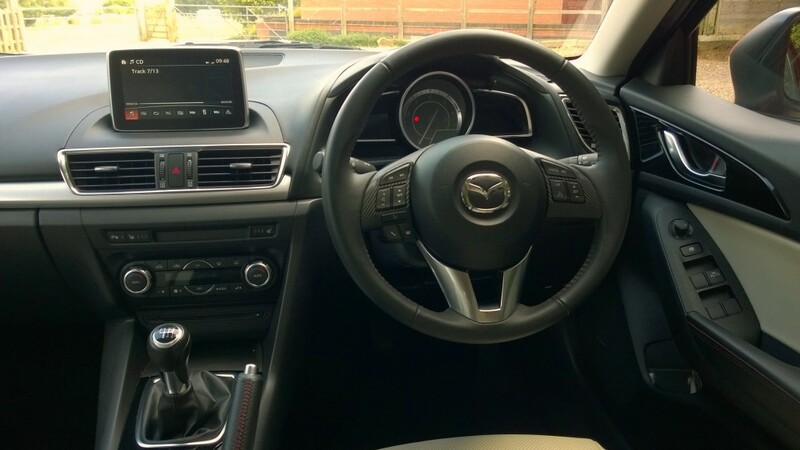 The steering too is nicely weighted offering good feedback, enabling you to accurately place the car on the road and a snappy action from the six-speed gearbox make changes a joy. On the right roads there is certainly a lot of fun to be had at the helm of the 3. At a shade over £22,000 for the top spec Sport Nav you see here equipment levels are more than generous. 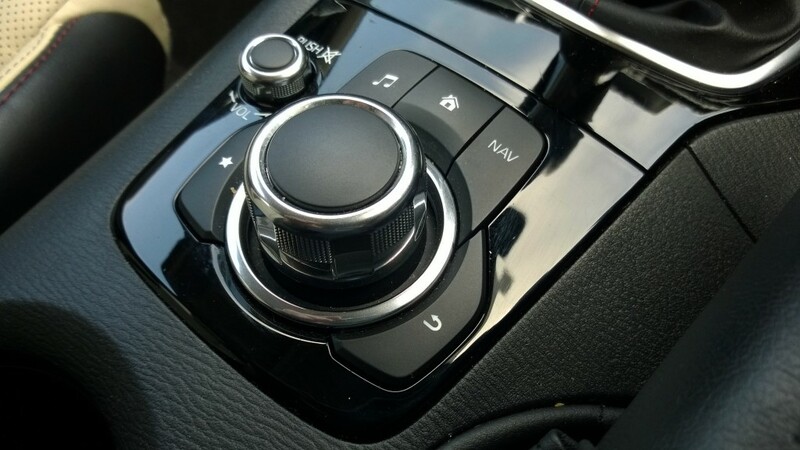 Dual zone climate control, 18 inch alloy wheels, automatic wipers and xenon lights, a seven inch touchscreen with sat nav and Bluetooth connectivity, front and rear parking sensors, keyless entry, heated seats, cruise control, and a head-up display all come as standard. 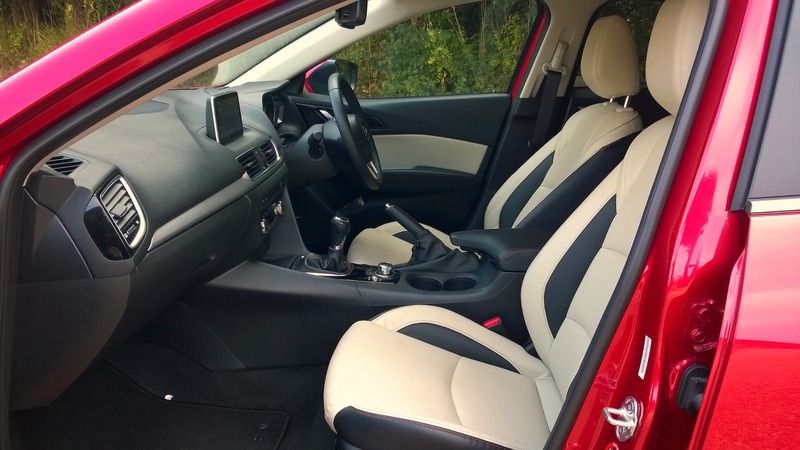 The optional Light Stone leather seats fitted to my test car are worth opting for as not only do they brighten up the cabin but they are also really comfortable and come with electric adjustment for the driver’s seat. Despite the relatively large capacity of the diesel engine compared to rivals, economy is nothing short of outstanding. Mazda quote 68.9 mpg combined with figures as high as 78.5 mpg on longer journeys. Whilst with me I managed a very respectable 50 mpg over a mixture of driving conditions. Road tax is also reasonable at just £20 per year as the 3 falls into VED band B with emissions of just 107 g/km of co2. This entry was posted in Car Reviews, Car Updates & Releases, Family Car, News and Views and tagged lease a mazda, lease a mazda 3, mazda, mazda 3 by Rob McSorley. Bookmark the permalink.